480th FS ( Warhawks ) callsign ” Gamble” was a dedicated Wild Weasel unit flying the venerable F-4E and G versions of the Phantom. They were used in the so-called ‘hunter/killer’ role with the F-4G hunting SAM sites and the F-4E killing them with the AGM-45 Shrike and later AGM-88 Harm missiles. Warhawks got the F-16 back in 1987 but they were no replacement to the F-4G dedicated to SEAD operations. This changes when the F-16C blk 50 was introduced in the 1990s. The F-16CJ/DJ Block 50D have the HARM avionics/Launcher Interface Computer (ALIC) resulting in a full autonomous employment capability of the HARM missile. This capability adds the SEAD (Suppression of Enemy Air Defenses) mission to the already extensive list of missions the F-16 is capable to perform including CAS, strike and air to air. The aircraft features full integration for the advanced AGM-88 HARM II missile, Sniper XR Targetting pod by Lockheed martin and AN/ASQ-213 HTS (HARM Targeting System). Sniper pod is mounted on the port side while The HTS pod is mounted on the starboard intake hardpoint and contains a super-sensitive receiver that detects, classifies, and ranges threats and passes the information to the HARM and to the cockpit displays. With the targeting system, the F-16CJ/DJ has full autonomous HARM capability. The HTS pod can be omitted however – in that case, RC-135 Rivet Joint aircraft support the F-16 in sorting and prioritizing targets in dense threat environments. Two AIM9x, Two AIM-120 ,Two HARM missiles and ALQ-121 Jamming pod are normally carried on a typical SEAD mission. Spangdahlem F-16 also spots a very unique camouflage scheme call the Have Glass 1 coatings. This coating consists of two efforts to reduce the radar cross section (RCS) It adds an indium-tin-oxide layer to the gold tinted cockpit canopy. This is reflective to radar frequencies but actually reduces the plane’s visibility to radar. An ordinary canopy would let radar signals straight through where they would strike the many edges and corners inside and bounce back strongly to the source, the reflective layer dissipates the radar signals. Have Glass 1 coating is very rough to the touch, and contains shiny flakes in it, almost like metal flake paint. This is illustrate on the 2nd pic on the bottom showing the roughness of the paint. The coasting also collects dirt and grime easily thus some of the F-16 with this coatings appears to be very faded and weathered appearance. On some examples, it almost appears as the jet is a single color gray that has a shine on the paint. Have Glass 1 rough coating as compared to the standard scheme on top. 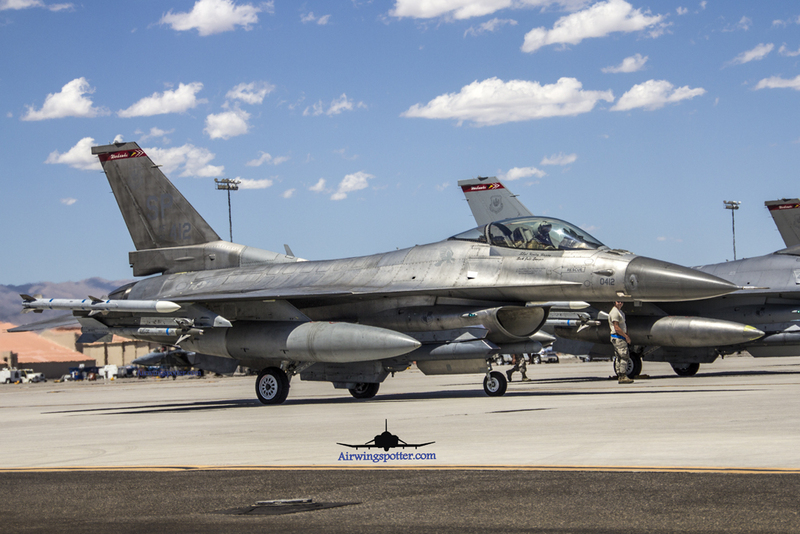 For Red Flag 15-3 , 480th FS participated mainly in the SEAD flying with another F-16 squadron 55th FS from Shaw AFB. 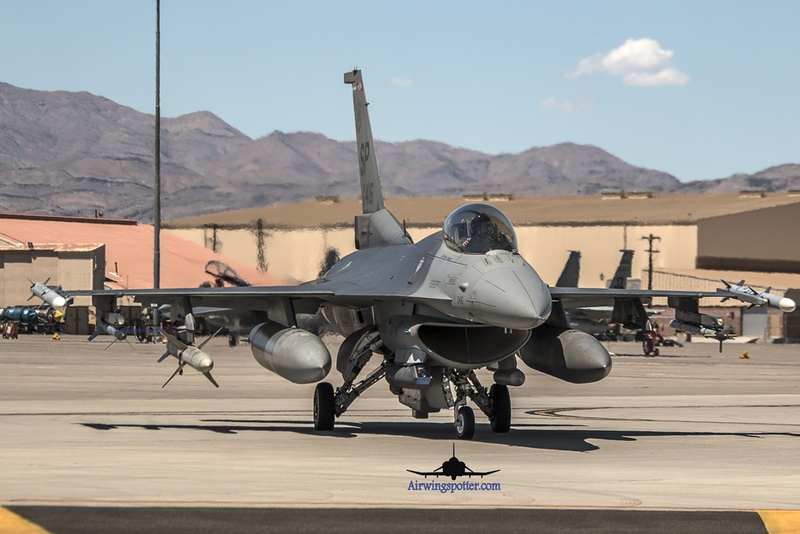 These are the aircraft that was in Nellis for the Exercise.